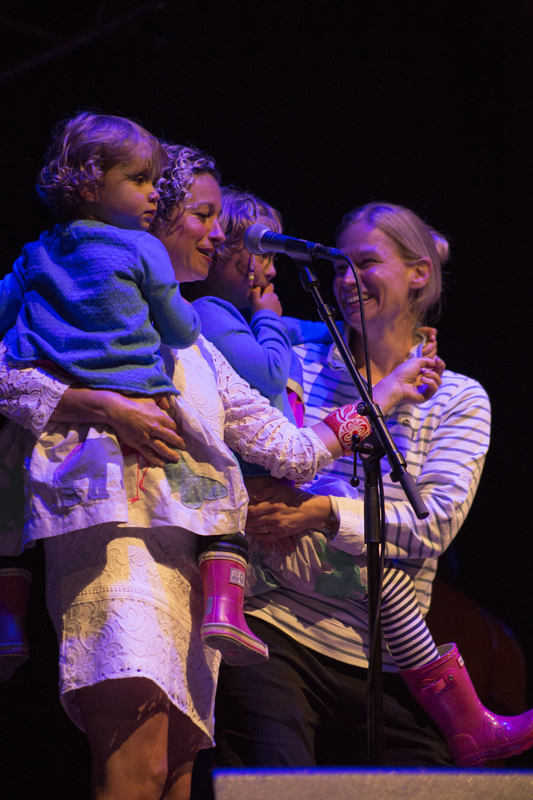 Last year, Underneath the Stars, a new festival and partnership between Kate Rusby’s family run record label Pure Records and Cannon Hall Farm, successfully saw around 8,000 music lovers come through its gates to experience three days of live music, food, drink and family workshops. To see this festival, bring so many people from out-of-town to Barnsley, was a real treat. 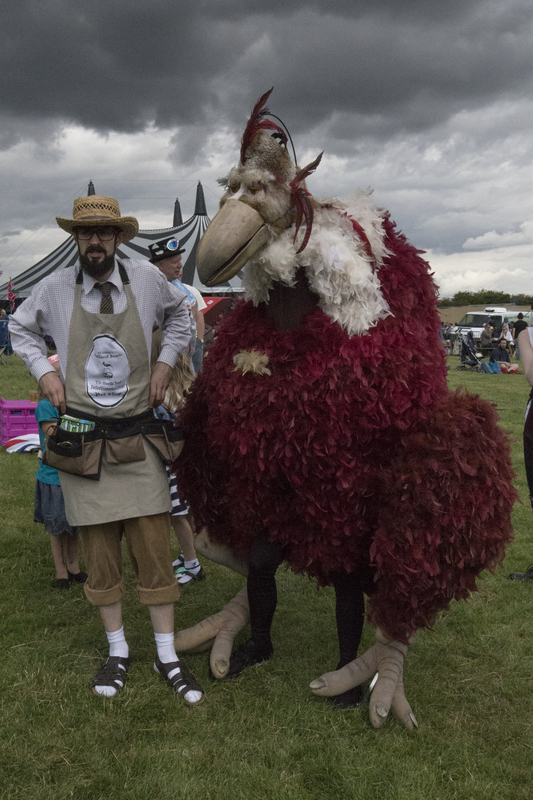 One year later, the organisers have added more music, introduced more stalls, workshops, family activities and food, and have rearranged the layout of the site. This year I decided to experience the festival with not only my photographer friend Lewy and wife Marla, but also my new four-month old son too. There were many families with young children at the festival this year, and despite my initial trepidation about taking my baby son camping, the event was entirely suitable for the very young, with lots of encouragement from organisers for that family friendly experience with a lot more engagement with the youngsters compared to last year. In fact, it was only the torrential rain that came later in the weekend that sent my wife and son home on Saturday evening. This year was a massive improvement on the last. In 2014, a number of stalls didn’t turn up, leaving the village area looking sparse. This year, there were two areas full to the brim of stalls selling crafts, arts, music, camping accessories, and lots of food – some of the best food you’ll see at any music festival including noodles, fresh pizza, vegetarian curries and tagines, Cannon Hall Farm’s own freshly cooked meat, churros, sandwich baguettes, fish and chips and not one sweaty festival burger in sight! Then there is the beer tent, selling an impressive range of real ale for just £3 a pint. Aside from the music, the other great thing about the festival is the array of activities on offer, including a children’s play area. A couple of my favourites were the Planetarium with over head projections and tours of the universe. I thought my baby would like this as he is very much into light shows, but as soon as he got inside and the lights went off, he did whale for 20 minutes. We experienced the workshop tent a number of times. On Friday, my wife had afternoon tea and crocheting and on Saturday with baby in tow, we checked out American folk musician Bruce Molskey and his ‘Introduction To Old Time Music’, which had more of a house concert feel to it. 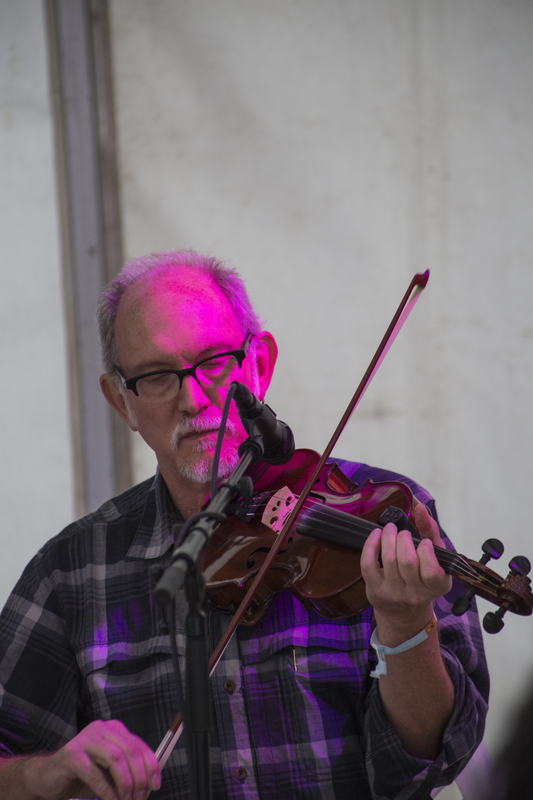 Bruce is a formidable fiddle player and the small but lucky audience heard from him about the traditional songs and tunes that influenced his music, with many examples played. My baby learnt to clap along to music while listening to Bruce play. Indeed, he claps along a little too much and as the heavy rains arrive, he throws up on himself and on me. And on Sunday, Lewy and I took part in The Pennine Drummers‘ session. Scattered around the tent were children and adults of all ages, hitting drums, bongos, triangles, tambourines and literally every kind of percussive instrument you could think of, minus a gong. The workshop leader called us over and invited us to play a large time keeping drums. He started a rhythm and everyone follows, improvising along the way. Like the stone balancing before it, this was therapeutic and great fun and an hour flew by. 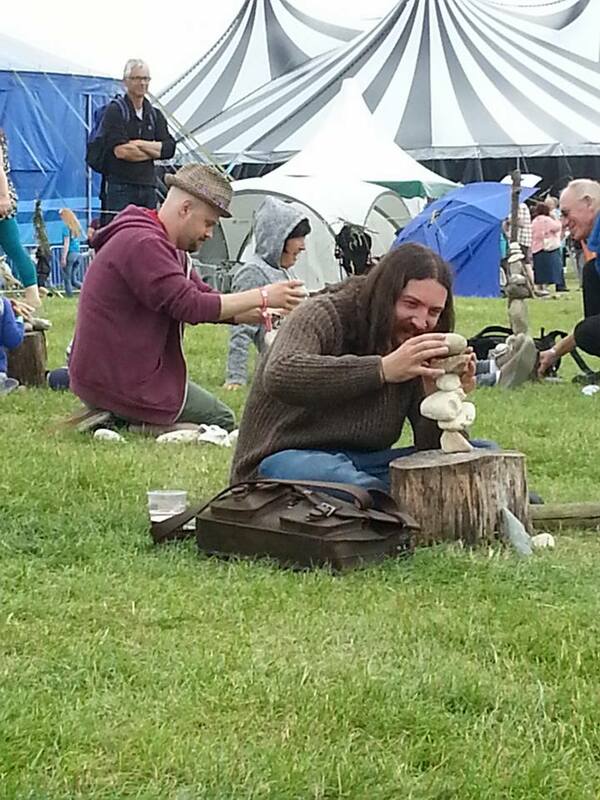 To be honest, you’ll find workshops like these at most festivals and I’d not tried my hand at it for a long time. I’d forgotten how much fun it was. 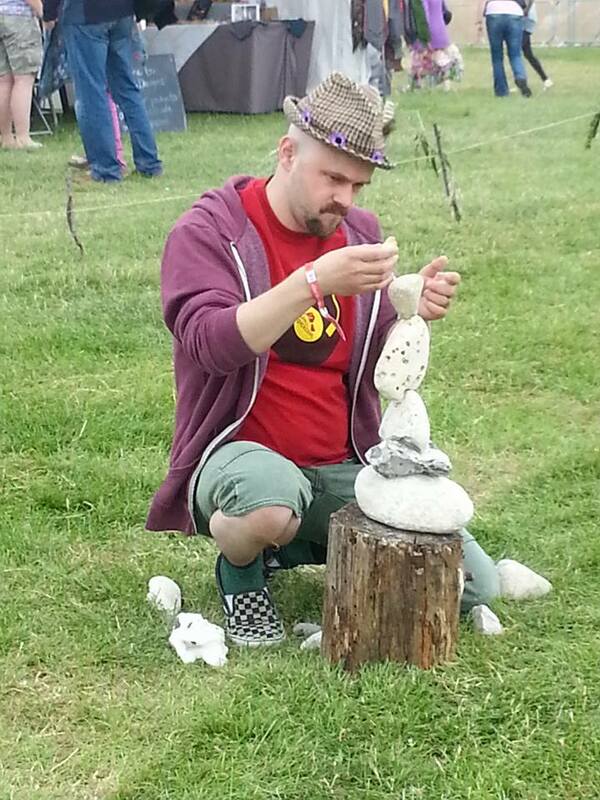 Another festival highlight was Responsible Fishing‘s appearance with their stone balancing workshops and display. Although already familiar with RF’s James Brunt’s brilliant work around Yorkshire, this was my first time trying it out for myself it was on the way to a toilet beak and I ended up easily passing an hour. I surprised myself by how quick I picked up the gravity defying art. 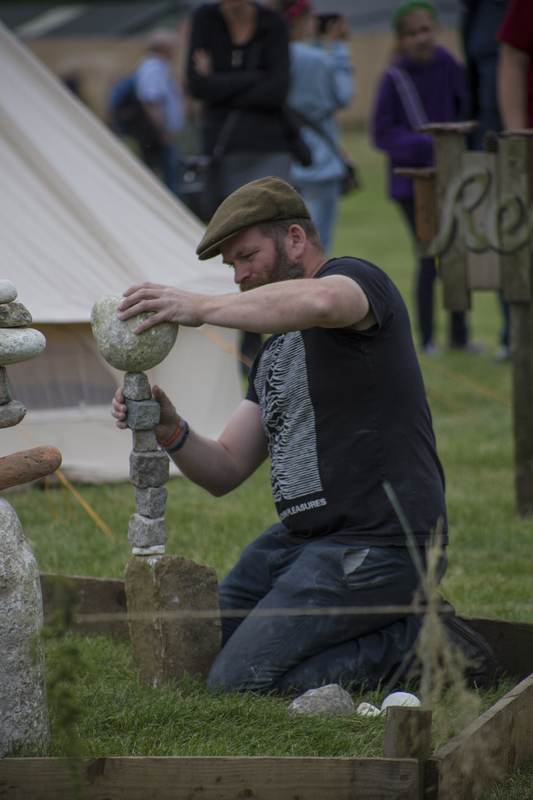 Stone balancing is definitely meditative and does give you a feeling of self-accomplishment. I reckon anybody could do it, given patience. The trick is knowing when to stop. A great addition to the festival. And so we come to the music. Once again, there are two stages. 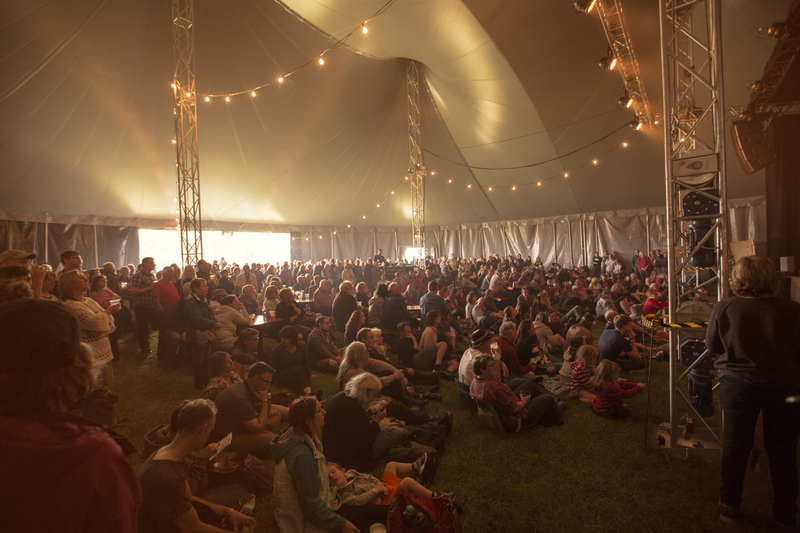 The main ‘Planets’ stage is a theatre-like set up under a big top circus tent and the second ‘Bitter Boy Club Stage’, once again acts as the beer tent. Less tables this time round, to lift its capacity and the bar to the side rather than the back. Last year the music ran from early evening Friday and finished early Sunday night. This year is started at 11:30am and ran through until 11pm every day. Having a baby with you means that most plans go out of the window. Moving from tent to tent, place to place, stall to stall, takes twice as long as normal, and so my the first planned full set becomes only a partial set. DAMIEN O’KANE‘s set is a far cry away from the one I saw him play a few years ago, when his music was stripped back bare, with just an acoustic guitar. Here, the raw, bare bones of both voice and songs shine through the gloss of multiple guitars, keyboards and a myriad of effects; and he loses none of the charm that pricked by ears the first time round. 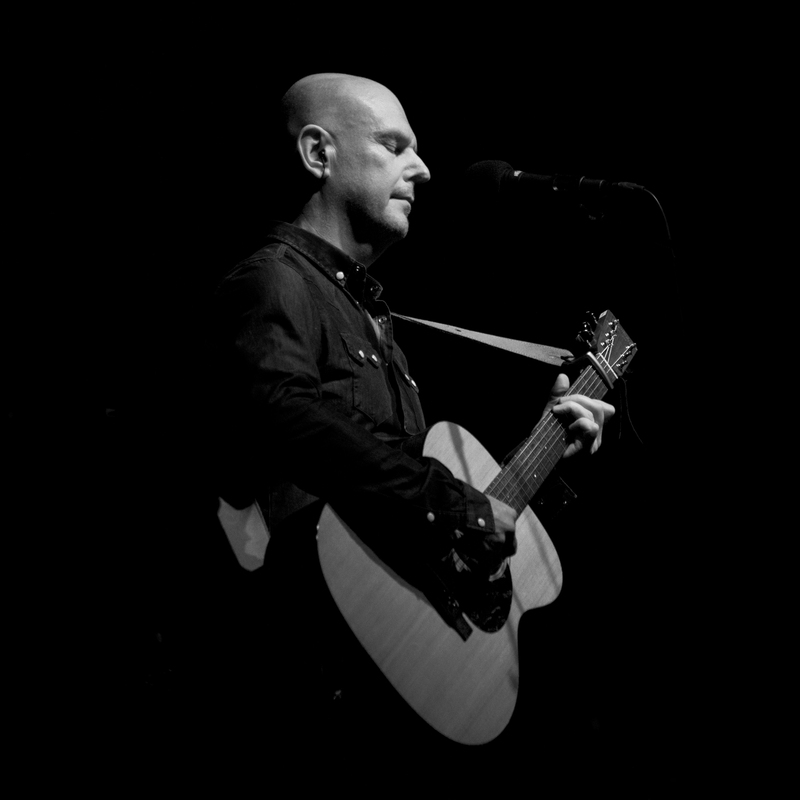 On occasion, his guitar work reminded me of Mark Knopfler and set highlight, Raven’s Wing, a song about an alcoholic father from Northern Ireland, is simply stunning. 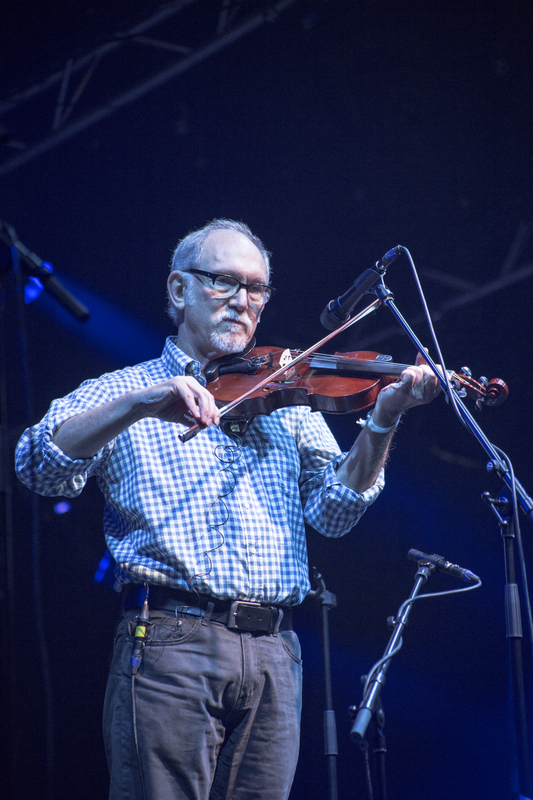 It also appears that missing half his set meant missing a surprise appearances from Kate Rusby, and while this shouldn’t be much of a surprise considering she’s his wife, I’m sure it ended up being an early highlight for many. While only familiar with MIRANDA SYKES through her work with Show of Hands, I’d been looking forward to checking out her new material with the brilliant mandolin player, REX PRESTON on the Bitter Boy Club Stage. She explains she’d left torrential rain in Devon, rain we knew we’d get later in the weekend. They mix the odd traditional Appalachian folk song and material from their new album, such as a track with lyrics by Chris Difford with more familiar numbers like the fantastic Red Prairie Moon Dawn and the brilliant set closer Me And My Sister The Moon, which featured all manner of double bass and mandolin solos and vocal trickery. At this point, my wife took my son off to explore the children’s area to give him a feed and I went to check out Leeds’ THE DO-RITE TRIO. 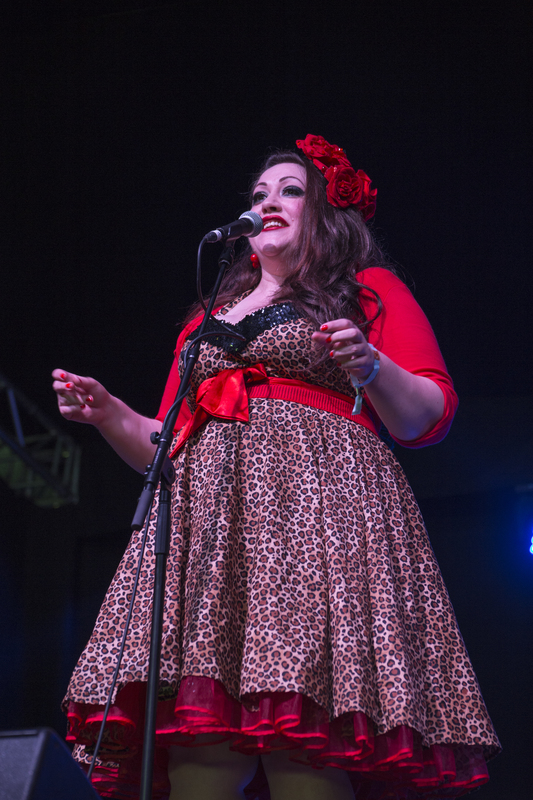 This retro jazz and blues outfit is fronted by Em Brulée, who I happened to have seen sing before in her other role as a Burlesque emcee. She is as awesome now as she was then – funny, vivacious and a red-hot voice make them an early highlight. Popular covers of My Baby Just Cares For Me, Perhaps Perhaps Perhaps and Hound Dog are played alongside more obscure numbers, such as Bessie Smith’s Gimmie A Pigfoot and Sister Rosetta Tharpe’s Up Above My Head. The fast numbers have a steam train rhythm and breakneck speed bass. The rest of the band all have a turn at fronting a number too but it’s Em that kills it every time. I Wanna Little Sugar In My Bowl and Fujiyama Mamma are personal highlights. 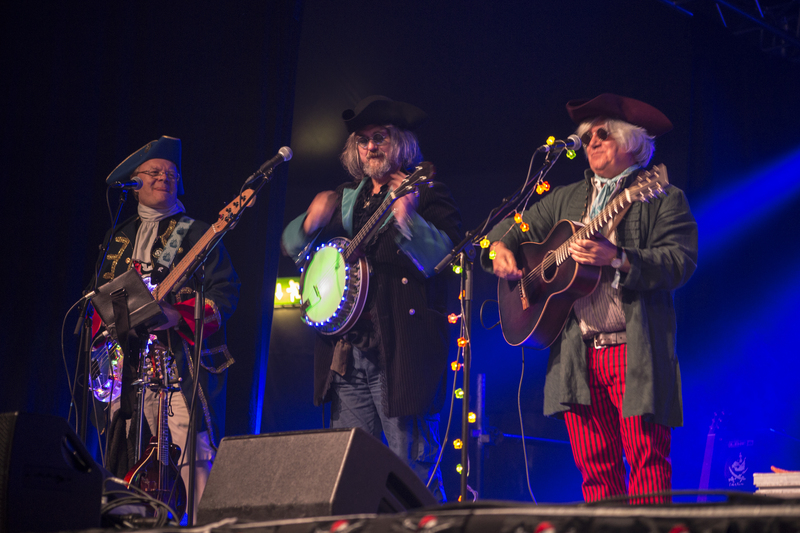 I much prefer the club stage’s atmosphere to the theatre setting of the main stage and despite Mark Radcliffe’s status in the folk world, his folk band GALLEON BLAST are at home there too. Radcliffe starts off with a joke about the festival’s ticket price being used to fund their fairy lights. 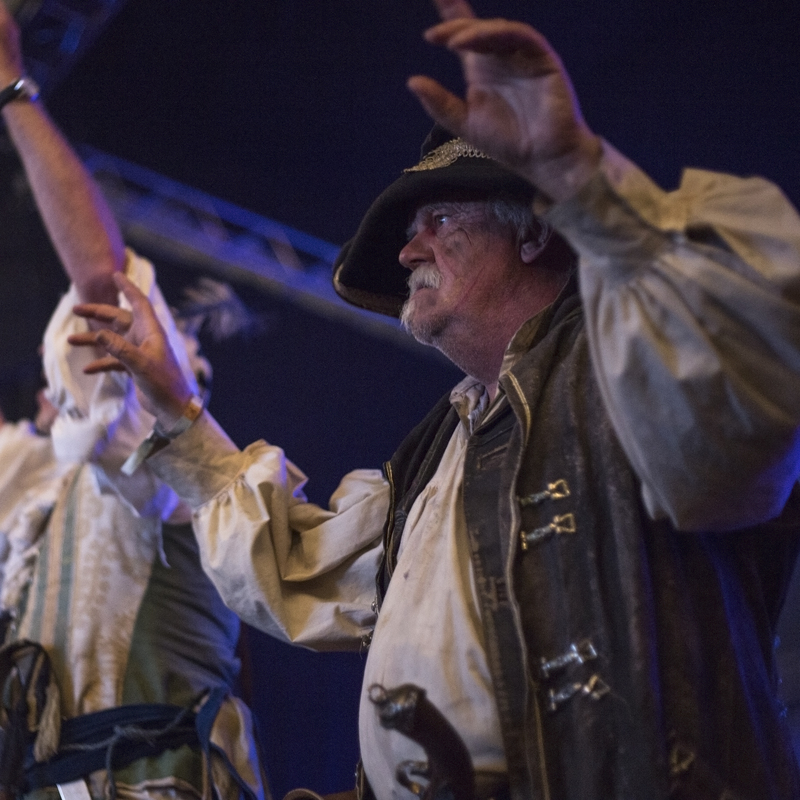 Their set features a real Scottish folk song from 1820 about a ship that got trapped in ice and sunk, tracks from their new album Band on the Rum and lots of banter about Barnsley’s fine sea-fairing tradition and the fine Barnsley Riviera weather. I Need To Get Bloody Well Drunk is introduced as a 20 minute jazz rock odyssey but it in-fact a quick-smart, raucous singalong. The seven man strong crew ends with a shout of to Jeremy Corbyn and covers of the Captain Pugwash theme and The Waterboy’s Fisherman’s Blues. Next up is ELECTRIC SWING CIRCUS on the main stage. They’re an unusual choice of headliner. Their fusion of 30s swing and electronica reminds me of everything from Mr Scruff to Glen Miller Orchestra and Janelle Monae to Cab Calloway, mixing Dub Step drops with Doo Wop bops. Essentially they are a dance band and I think their show is lost in the enormous main stage tent. I imagine the band going down well in a small venue like the Leadmill, rather than a theatre, and is probably more suited to the intimate second stage. The tent is nowhere near capacity and they lose me half way too. It’s a shame as I think they’d have really got the floor shaking next door. Still, a fantastic laid back first day. 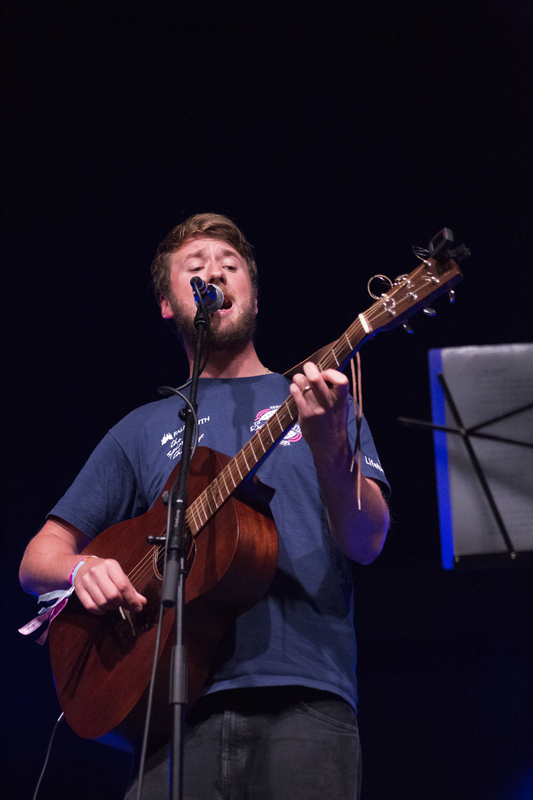 First act of the day was local lad, seventeen year old TOBY BURTON from Penistone. I was already familiar with his name from the local open mic circuit, and here he’d been given the opportunity to play to a big crowd. He opens with a cover of Bombay Bicycle Club’s Lamplight, followed by Slow It Down from his new album. It sounds like a more restrained and tender Mumfords. 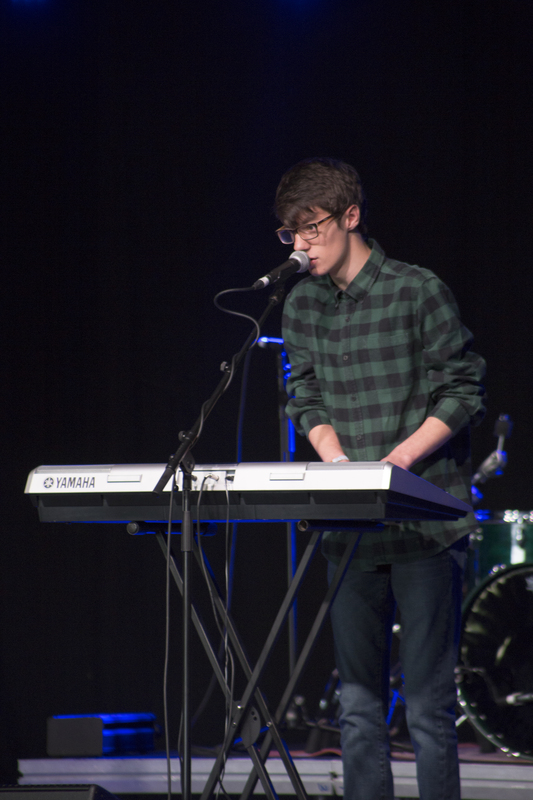 Toby switches from guitar to piano during the set and continues with the mixing of self-penned songs such as Twenty-three and Time Flies, with carefully selected covers by Passenger, Daughter and City In Colour. 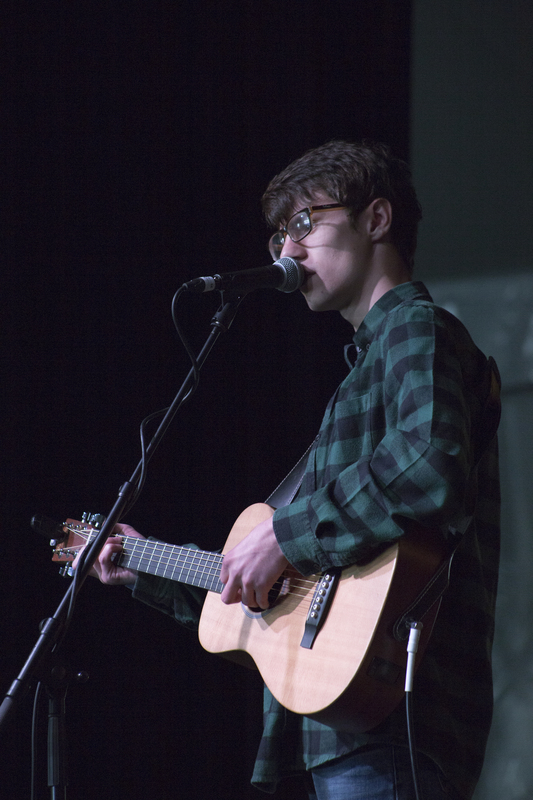 He started his set with an admirable audience of around 400, but as the set goes on, it swells to around 800. The weather is good outside and so this is all testament to Toby’s talent. The only faltering moment is during the encore, when he appears to run out of material and plays two songs from his set a second time. That was our cue to leave. But still, a fantastic set to a very generous crowd. 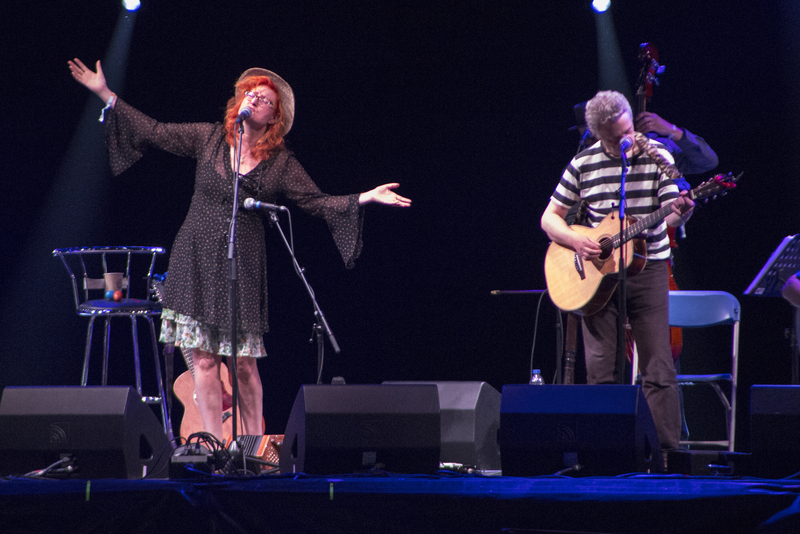 Due to a baby sick explosion and having to get changed I miss most of EDDI READER‘s set. Though while walking to the camp site, I do here the audience singing along to her biggest hit, Perfect. On my way back from the tent, Reader is playing versions of Love Is A Loosing Game and Moon River. They sound really nice, but after being covered in baby sick and lots of rain, the sound of a beer being poured is a little more appealing. It also means ensuring I get a place up front for EDWINA HAYES‘ set. 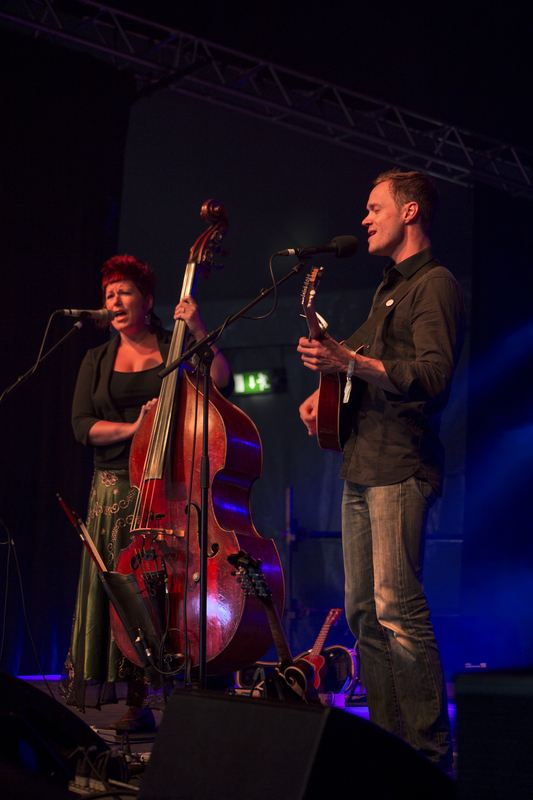 I only saw Edwina play a few weeks ago, when she and fiddle player Dom Dudill got up to play a few songs together at Barnsley Folk Club. They were there to watch Dave Burland, but their floor spot went down so well, they were asked to play a few more. Here she performs to an almost capacity crowd. She is funny, humble, instantly endearing and of extraordinary voice. She explains to us that her songs are ‘a bit depressing but luckily they’re all short too’ and if we’re losing the will to live, it’ll be over in a flash. At times she reminds me of Joni Mitchell but mostly her voice is entirely unique. Each of her songs is lovingly accompanied by a funny anecdote, especially the one about meeting (stalking) Richard Thompson, whose From Galway To Graceland she makes totally her own. Even though the heavy rain brought the masses into the tent, you get the feeling that if they’d have heard her voice on the wind, they’d have made it into there anyway. She closes with the song that has given her notoriety around the world, Randy Newman’s Feel Like Home. 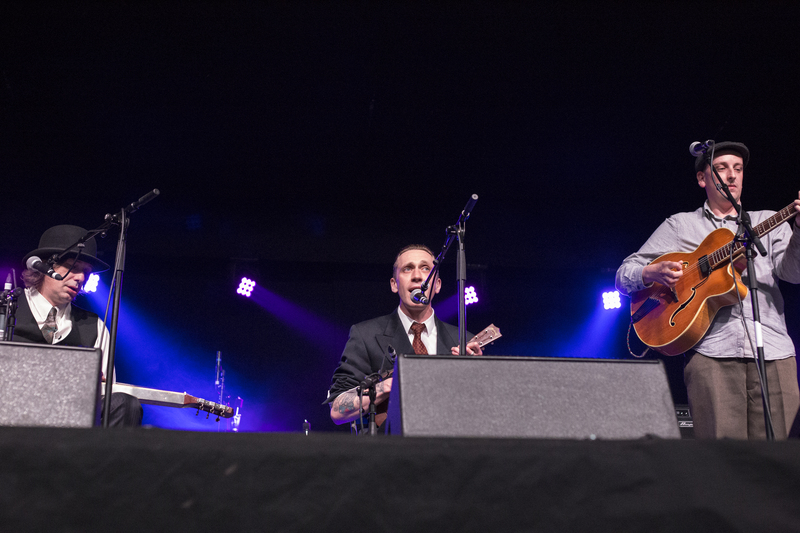 Edwina is immediately followed by THE JASON TITLEY COLLECTIVE and a set of barn-storming bluesgrass played on guitar, mandolin, banjo and double bass, delivered at breakneck speed. They sing in convincing American accents and brilliant harmonies but it is when they play some old-time reggae and the traditional Appalachian number, Little Maggie that they really tickle my fiddle. 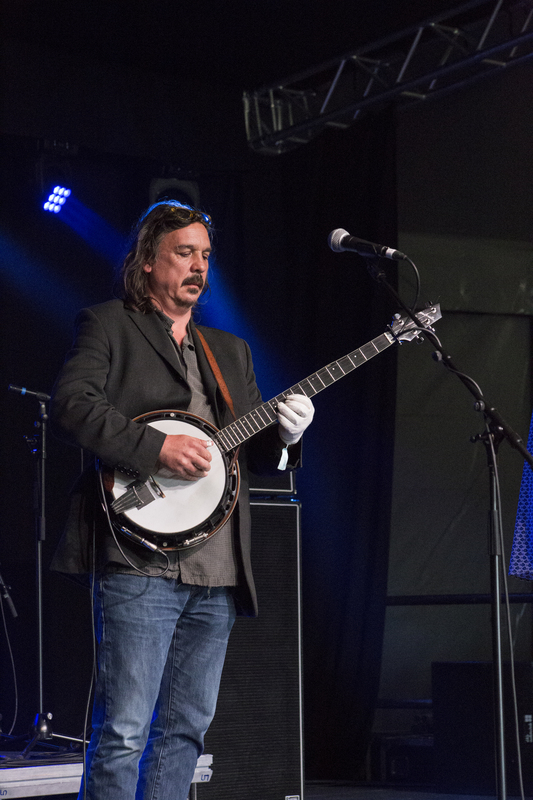 BOB FOX follows on the main stage and opens with The Ballad of John Askham and an audience singing along to ‘we’re the boys who keep the engines rolling’. He says that most of the time, his audiences sound like owls and snakes, rather than steam trains. Despite being notorious on the UK folk club scene since the early 70s, in recent years, Fox has found new fame as the ‘songman’ in the National Theatre’s War Horse. 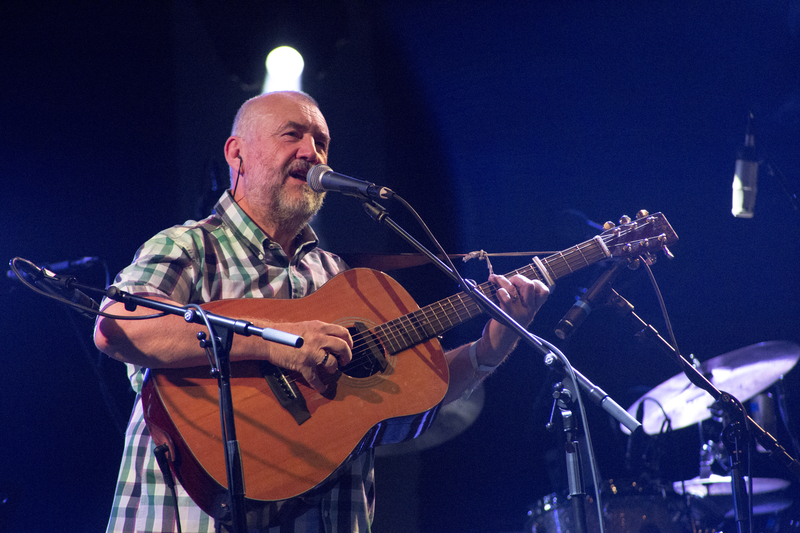 He plays a couple of songs from that production; a song by Jez Lowe, who he’ll be playing with at Barnsley Civic next year as The Pitman Poets and a number of traditional songs he has picked up on his forty-year journey. He is not only a master story-teller but a red-hot guitarist too. 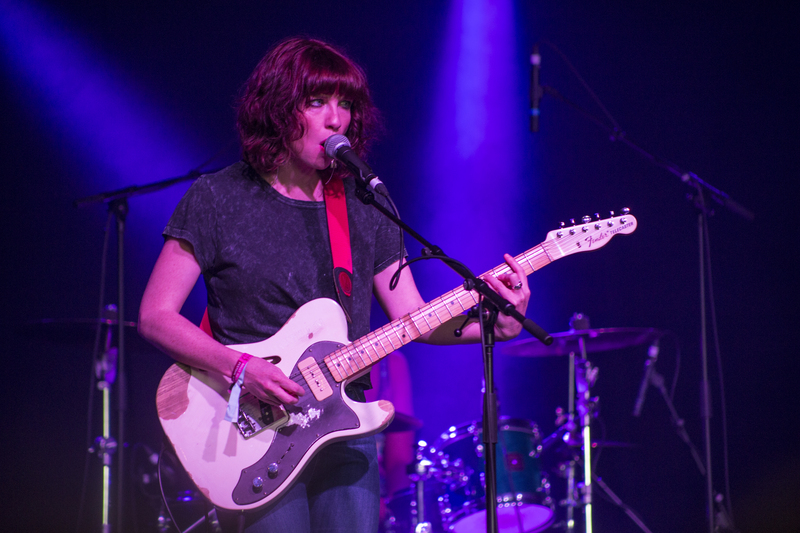 CRY BABY CRY are another slightly left-field addition to the bill. The Leeds band is fuzz-heavy Alt Rock with the groove of late 60s Blues Rock, such as Sabbath. Echoes of White Stripes, Zepplin, The Kills and Black Keys reverberate throughout their set. Also noticeable is the handful of elderly music fans who up and leave, who find the sudden turn in volume isn’t for them. It is right up my street though, especially Tombstone which sees Rosie and Johnny sing back and forth at each other like an erratic Nancy and Lee before ending the number like a heavy metal train song. Rosie Doonhan rocks her bangs and bass like a young Suzi Quatro; the band are an exciting addition to a bill full of folk and roots, made all the more interesting as her grandfather John was a world champion piccolo player and her father is Mick Doonan, one of the founding members of 70s folk outfit Hedgehog Pie and later The Mighty Doonans. 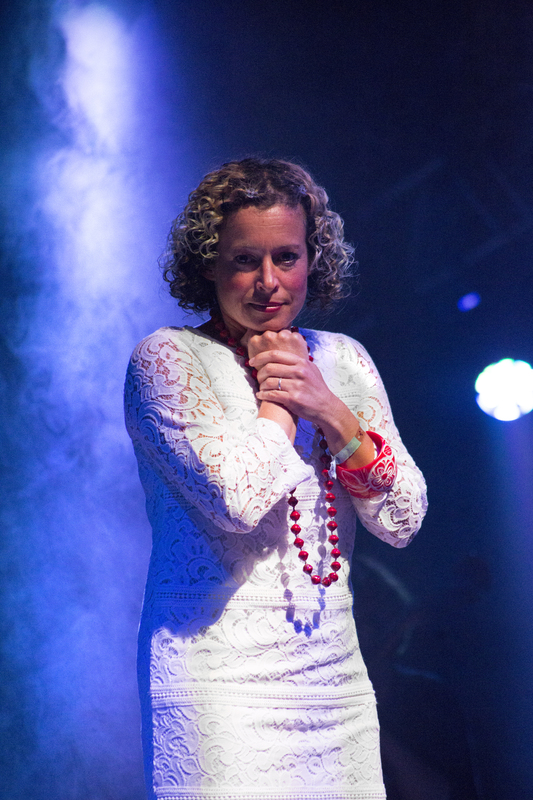 She herself has played tours with Peter Gabriel and Birdy and has even produced an electro-swing record. PHILIP SELWAY is a big pull for me this year. Having the drummer and a song-writer with one of the most important and influential bands of the last twenty-five years, Radiohead, is something quite special for a little town like Barnsley. He is also a big Kate Rusby fan and has contributed to her music before. Here he’s been invited to play music from his solo records. 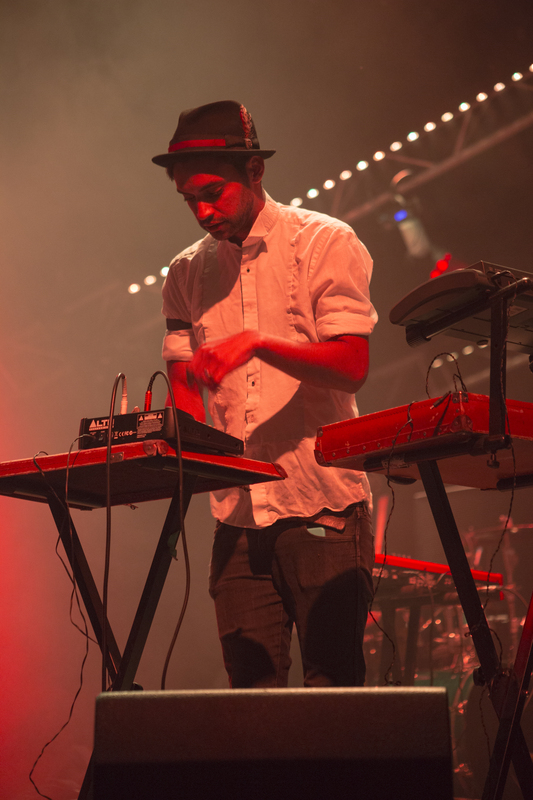 The three musicians playing with his move around the stage following every song, switching instruments; synths, saw, guitars, bass, drums and xylophone. 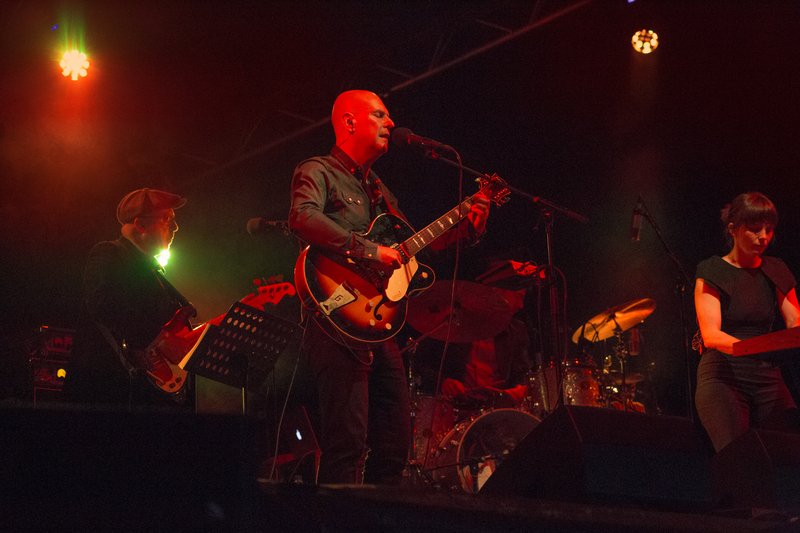 It’s strange seeing Selway stood up front and not sat behind a drum kit. He has a slight awkwardness about him and at times even moves a little like Ian Curtis. It’s no surprise that a lot of his music sounds like later-Radiohead and vocally he is reminiscent of Depeche Mode’s Martin Gore. Indeed, a handful of numbers such as Coming Up For Air are also reminiscent of Depeche Mode’s later material. Bat For Lashes isa reference point on Don’t Go Now and Running Blind. Closing number It Will End In Tears recalls early Roxy Music, Wish You Were Here and dare I say it, even a little Hey Jude – minus the nauseous singalong. It’s an enjoyable and eclectic set and has prompted me to explore Selway’s catalogue at more depth. I’m really not into Mary Chapin Carpenter and so my last band of the day is KESTON COBBLERS CLUB on the Bitter Boy Stage. And what a band to end on?! 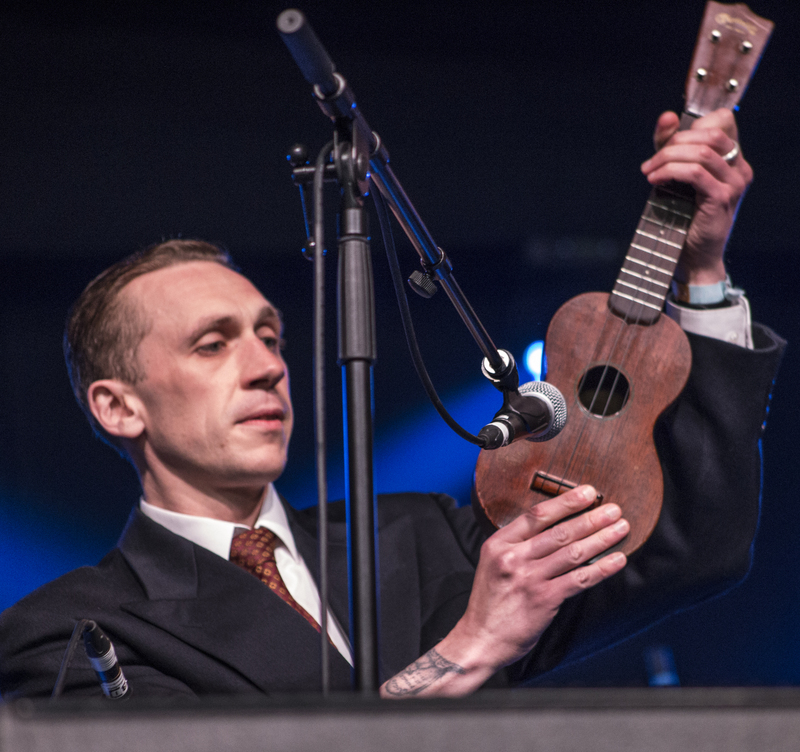 Vocalist Tom Sweet has a tone slightly reminiscent of the Mumfords and Matthew Lowe a little of Rufus Wainwright. This band has tonnes charisma, quality songs and a big emphasis on great vocal harmonies, like on new single Wildfire. 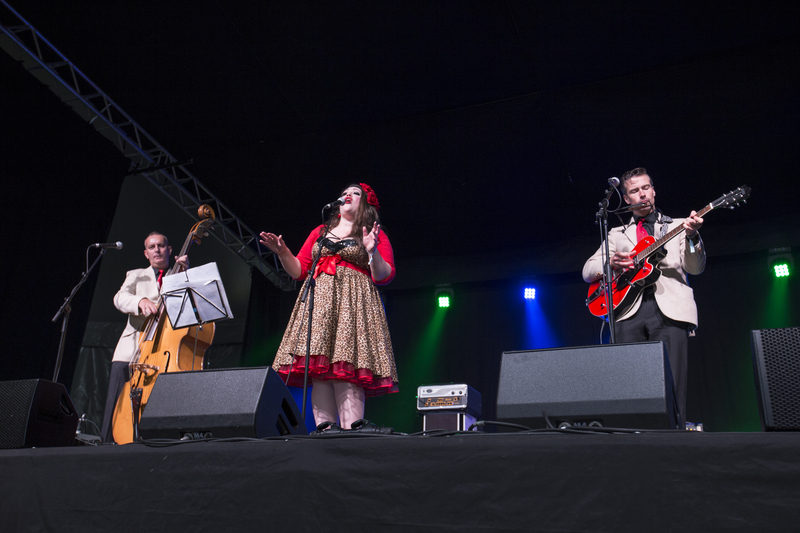 It’s hard to pin the band down, as they mix in so many genres, samba, Americana, Parisian folk, marching band, bluesgrass and a big lashing of Baroque Pop such as Devotchka and Arcade Fire. The star of the band though is Bethan, the tuba player. Absolutely any band would be instantly improved by having her in it. 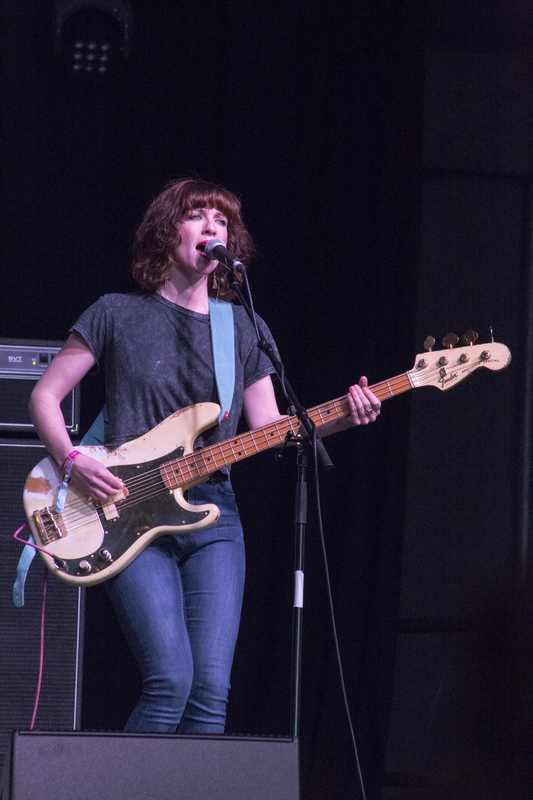 She is not only the driving bass for the band but also does an awesome job of getting the crowd up on their feet and dancing. Even after a mix of dust bowl ballads and joyous barnstorming folk pop, they have time to fit in an encore of Fleetwood Mac’s The Chain. 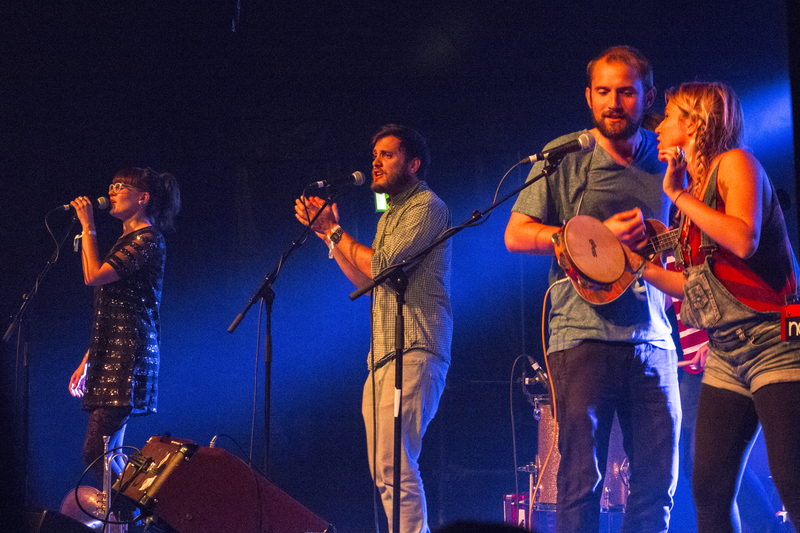 They were an absolute delight to experience and are easily the highlight of the festival so far. I go back to my tent with a big grin on my face. 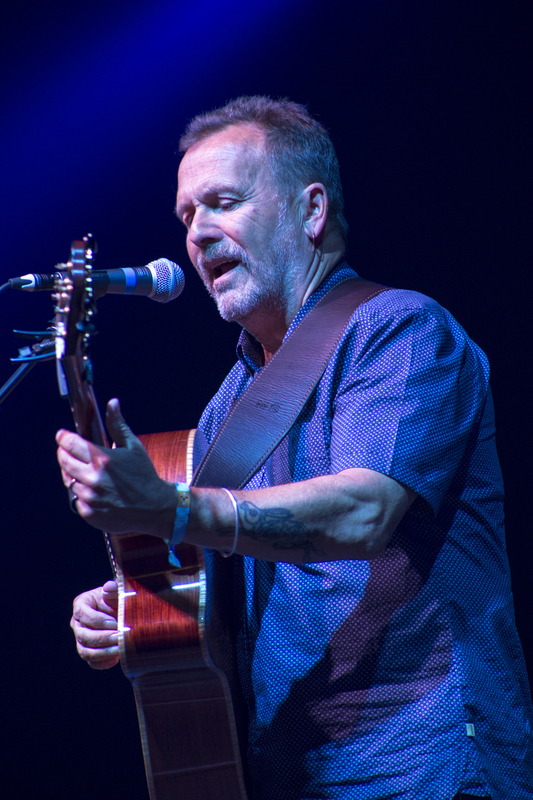 The first act of the day is MARTIN SIMPSON, who I last saw at Folk By The Oak. He is one of those amazing people, who on top of releasing copious amounts of his own material and collaborations, he also takes part in many historical music projects around the country. That diversity shows in his set. Firstly, it’s a master class in finger-picking. Second, he’s a first-rate story-teller. There are the war songs, a dramatic broken token ballad which switches between major and minor keys throughout and Dark Swift, Bright Swallow about 1,100 US soldiers who were killed by German U-boats as they rehearsed on British beaches for the Normandy landings. There are murder ballads and fun covers, like Heartbreak Hotel. However, it is the always moving Never Any Good and Delta Dreams, a mix of Dylan and Paul Simon and a tale of a ’55 Chevy Bel Air that are personal highlights. 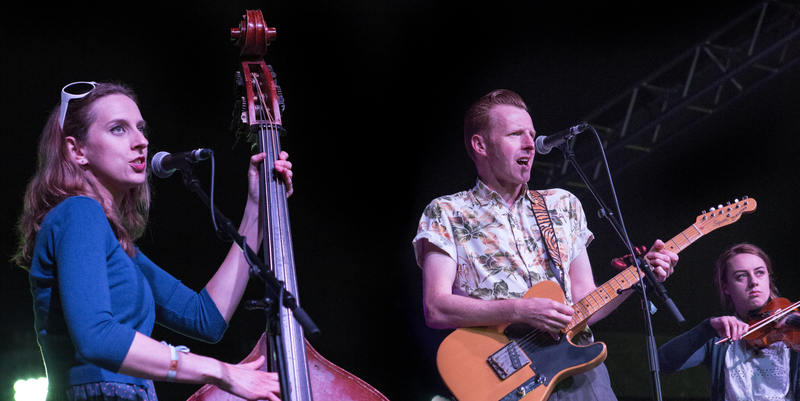 The festival has been a great showcase for British bluesgrass and vintage rock n roll acts and THE RIP ROARNG SUCCESS and their brand of southern swing are another fine example. Original songs, such as Hot Rod Momma sound like they could have been plucked right from the 50s and stand up against covers of Wayne Hancock and Bob Wills and his Texas Playboys. When they announce they’re going to play some Sinatra, surely I’m not the only one waiting to hear Frank but I’m delighted to hear a rip-roaring version of These Boots Are Made For Walking. An added note is that guitarist/vocalist Russ looks like a skinny Jerry Lee Lewis. HOPE & SOCIAL area a strange one. They’ve made their name from playing festivals, theatres and their involvement in various arts projects – I saw them play previously as part of a public art, psycho-geography project call Bring The Happy. Comparisons to The E-Street Band and Arcade Fire do stand, but I’d also add Van Morrison’s big band and Polyphonic Spree. They’re like some crazy Christian rock band. They aim higher than uplifting and try to take the entire audience with them but it takes more than this to lift my steely heart though. 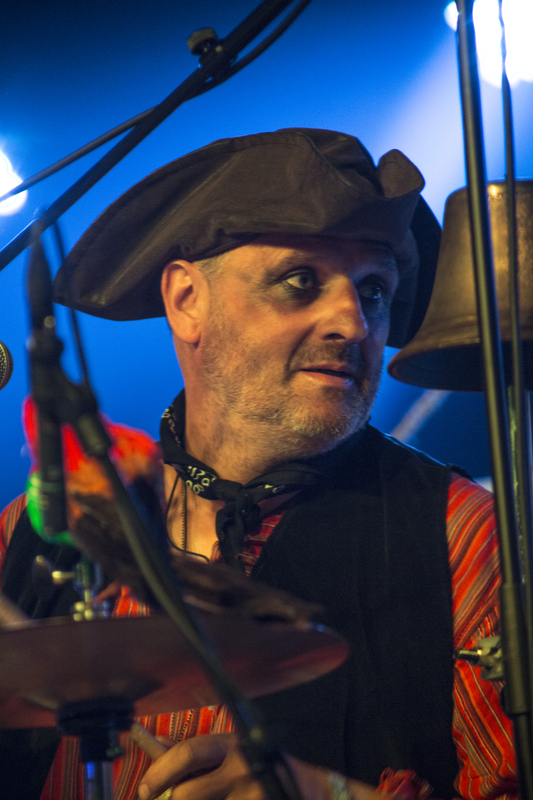 And although it is very hammy, and they encourage the audience to dance, sing, run on the spot and punch the air at any given opportunity, there are a hell of a lot of very talented musicians in the band. However, it definitely isn’t my thing and we leave mid-set to grab food and get a spot up front for Ukulele Uff instead. Liverpool’s UKULELE UFF, LONESOME DAVE & BROTHER BILL kick off with a ditty about hating your ukulele playing neighbours. Dave plays a mean guitar and Bill a slick Hawaiian lap steel but up front centre is Uff, who looks like he’s been spliced with the DNA of George Formby and Tom Hardy. Their mix of skiffle and 1930s jazz was unbelievable to watch. Uff plays and slaps that uke with no speed I’ve ever seen before and even though the technical skills are impressive, with their best three-piece suits and hats, the trio are fun too. John Philip Sousa’s 1897 march Stars And Stripes Forever turns out to be the classic football song Here We Go, Here We Go, Here We Go and their take on the traditional Liverpool folk song Maggie May, about a prostitute who robs and homeward bound sailor are both first-rate. Definitely one of my favourite acts of the weekend and the first CD I bought from merch too. 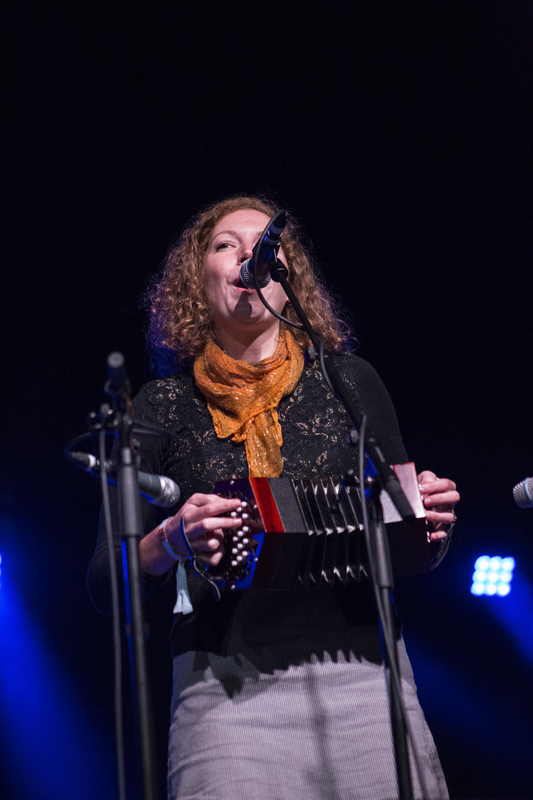 HARBOTTLE & JONAS are accompanied on stage by a friend of their’s from Yorkshire on cello and accordion. They have a unique and accessible take on the traditional and write fine songs about local characters. 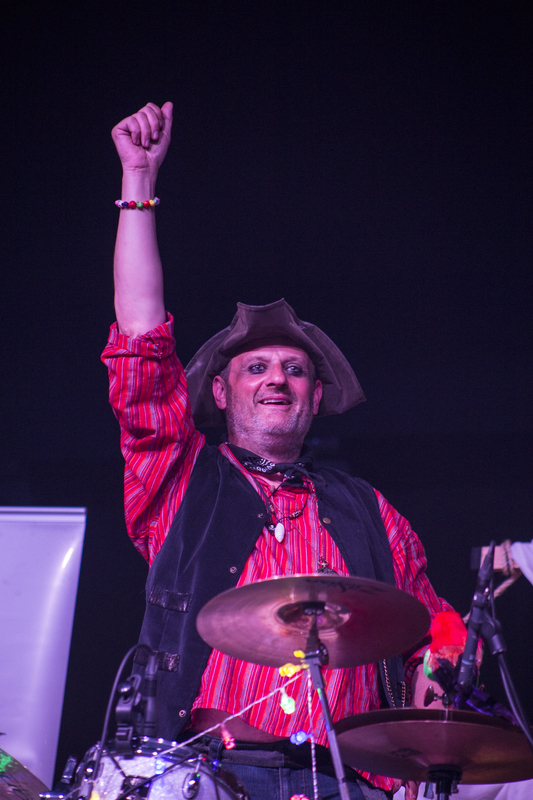 The ones led by David are percussive and upbeat and they get the audience up and singing on their first song. They play a good number of original songs too – Carry On You Fisherman is particularly excellent and vocalist Freya even sounds a little like Sandy Denny too. As is their song written about Huddersfield’s WWI conscientious objectors. I’d been looking forward BRUCE MOLSKY‘s set, ever since catching his workshop the day before. He takes to the stage to rapturous applause and honestly, before this weekend, I had no idea who he was. I also didn’t know it was possible to play the fiddle with both press down your fore finger on the low strings and your pinkie plucking the high ones. How does anyone even do that?! Most musicians would have to have a looper to pull that trick off. He covers all bases; mountain songs, blues, Appalachian ballads, West African folk songs and field hollers. Much of his set is instrumental but he balances that out nicely with stories and humour and a fantastic singalong encore of Cotton-Eyed Joe. 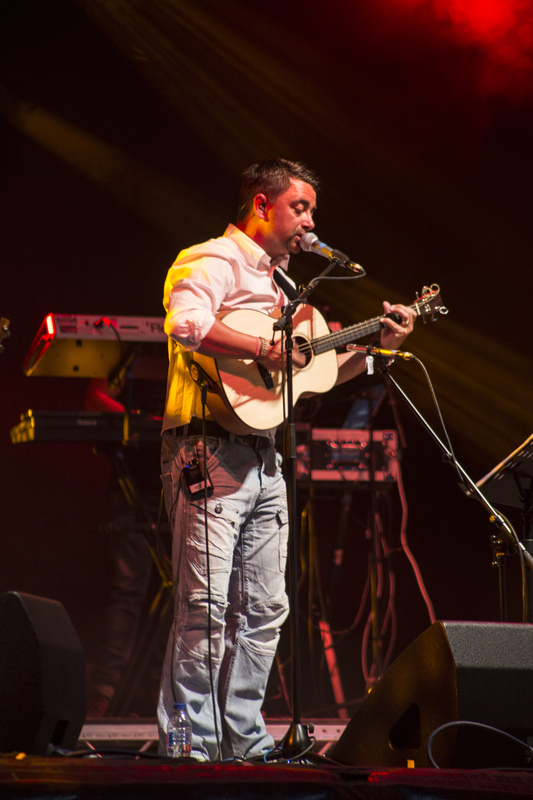 The penultimate act of the festival is actually the headliner and the festival’s name sake. 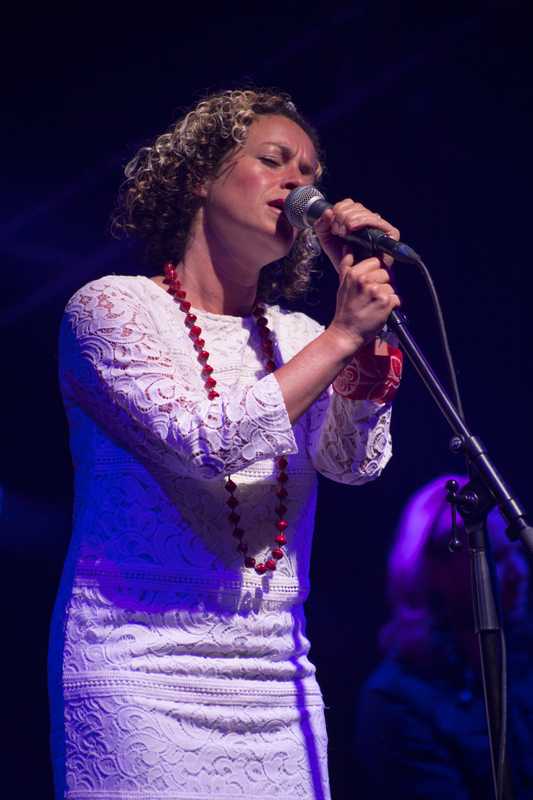 Everything about the festival is named after KATE RUSBY songs. Fans have travelled from all over the UK and as far afield as Germany to see Rusby play this evening. 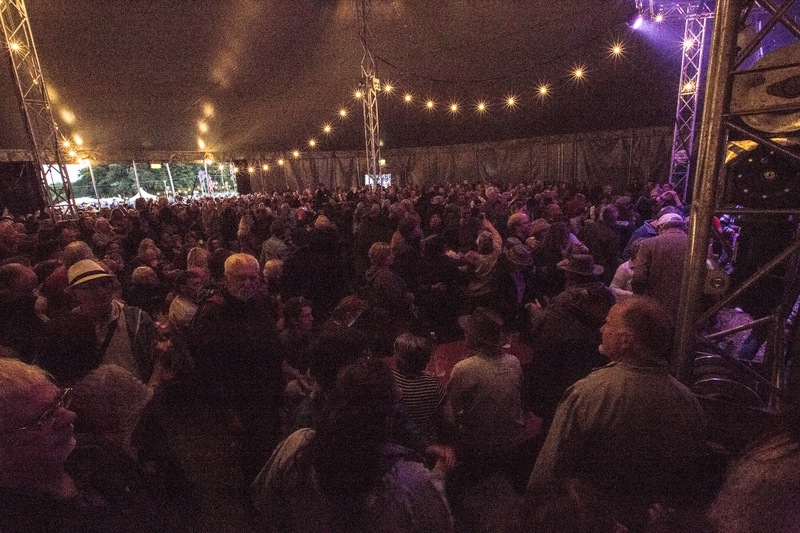 The big top is full some half an hour before she takes to the stage, with more occupying the aisles. I wrongly assumed that the ten empty chairs up on stage were for a brass section and as they were soon occupied by The Red Skies String Ensemble. Kate and the rest of her band soon took to the stage as the ‘underneath the stars’ lighting, not seen over the weekend until now, shone down on them. Following a short technical delay, they open with an ethereal Outlandish Knight. A number of tracks from last album Ghost are played; drinking song Martin Said, which she learnt from her parents at five; The Night Visit and the atmospheric title track that tells the tale of a local spirit. As usual, the ‘Barnsley Nightingale’s’ humour shines through too; running off stage to get her winter coat and when guitarist/husband jokes that he wants his too, she says ‘you don’t need it because you’re tough. Not in a dress though; or at least not when you’re at home’. Alongside Ghost, traditional May Day song We Will Sing and Cruel with its refrain of ‘haul away boys’ are set highlights. 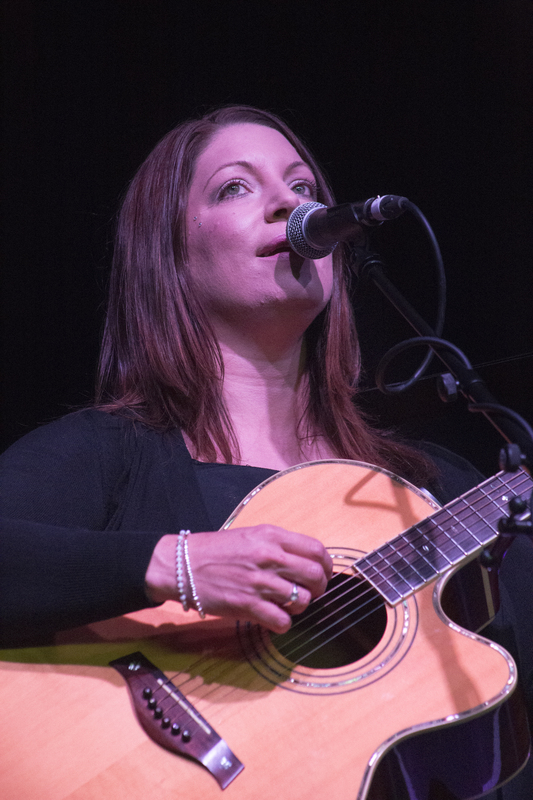 Fan favourite, the uplifting Awkward Annie ends the set on a high and while the set is short by Rusby standards, there is still room for an encore. Kate invites Bruce Molsky back on stage – who is about to leave for a flight back to the States any minute – to run through a crowd pleasing version of Wild Mountain Thyme. A well deserved standing ovation ensues and despite its short length, is the best (out of five) Kate Rusby gig I’ve seen. And so how do you top the headliner? 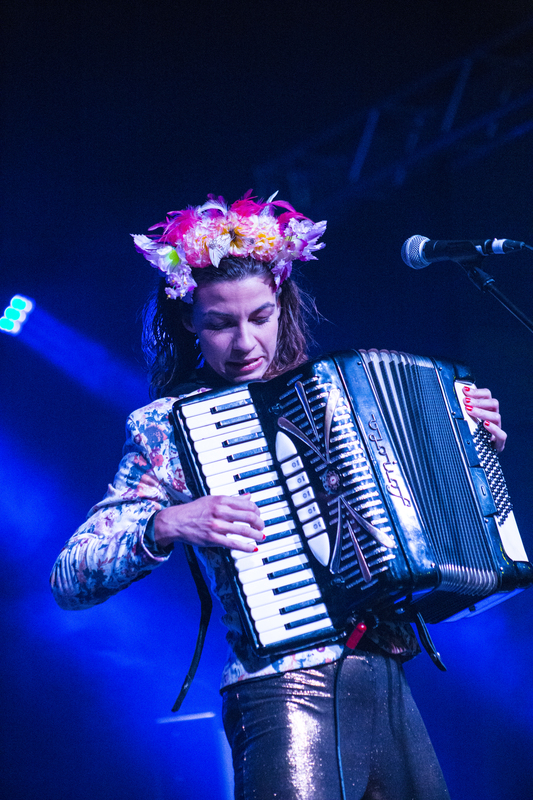 MOLOTOV JUKEBOX, that’s how. For those that decide to stick around following headliner kate, the festival highlight was still to come. There can’t be that many bands that start by playing their own fanfare and end with the staff dancing on top of the bar. Molotov Jukebox are like necking every colourful drink in the bar, good ones and bad, and dancing yourself stupid til the sun comes up. They’re exotic and intoxifying. 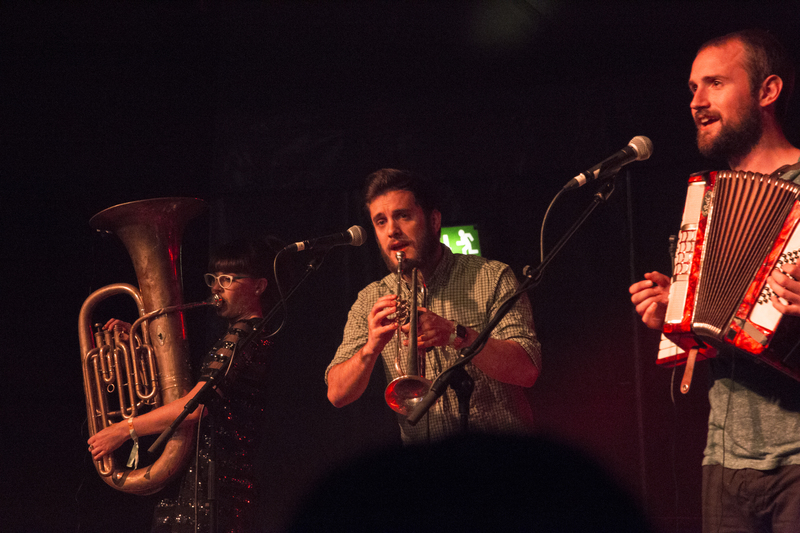 They remind me of Devotchka and both The Noisettes and No Doubt in their early days. 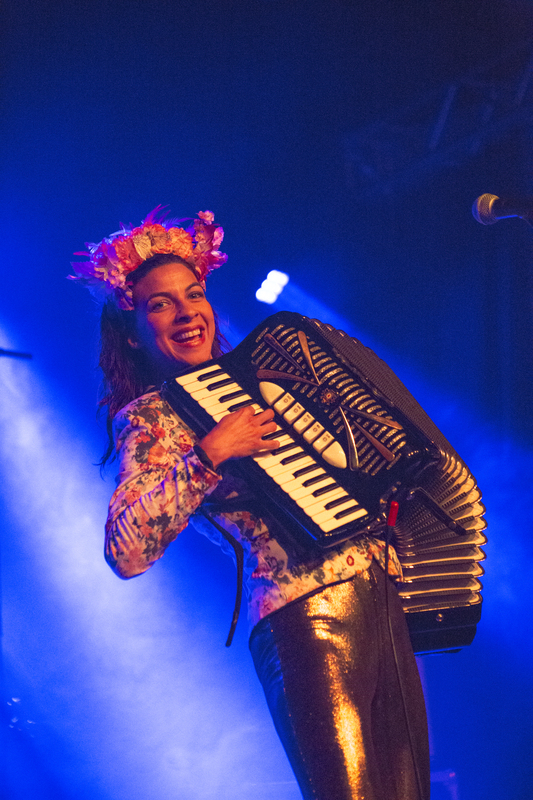 Natalia Tena is the perfect front person and when Angus Moncrieff blasts away on his trumpet, she looks at him like he’s on fire. 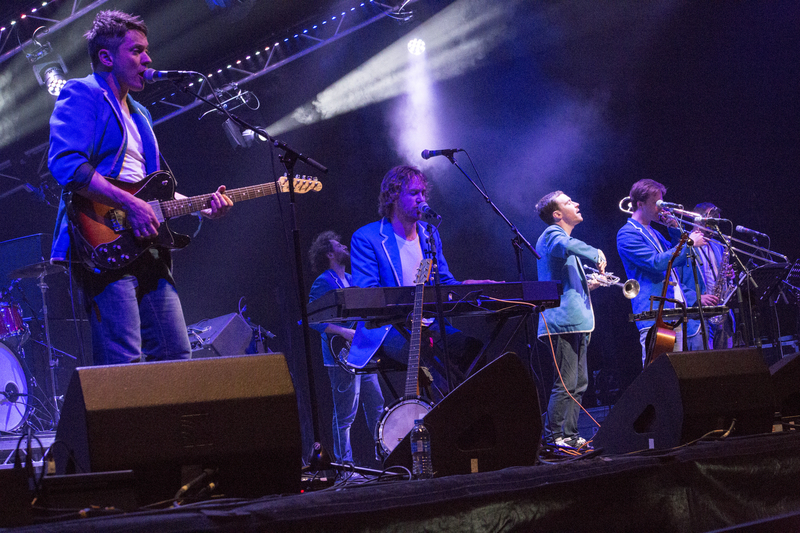 The band are red-hot – likely to be the highlight of any festival. We get an encore but it’s not enough. The audience want more but don’t get it. I head outside to buy a CD before we head off to the car to drive home. What a weekend! Underneath the Stars was a massive improvement on the previous year, with more food, stalls and workshops in the festival village, an improved layout and despite the often torrential rain, a better atmosphere. To have done so much in only two years is a credit to both the Pure Records/Cannon Hall Farm partnership and the many volunteers that made it happen. There is room for improvement though. 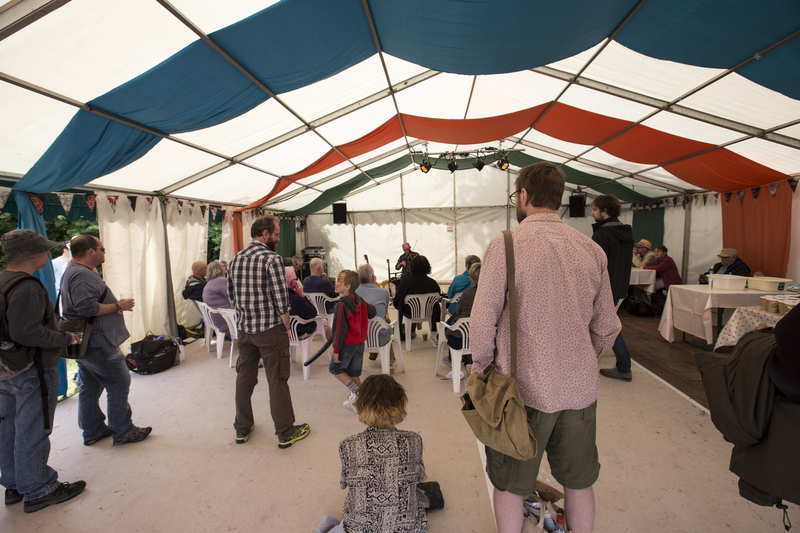 Always more music; maybe a small third stage or busking tent out amongst the stalls and workshops. For those with small children, a quiet sheltered area suitable for feeding, changing and resting too. What, with Barnsley’s healthy history of folk music, its beautiful setting of the Cawthorne countryside and a roster of world class artists and thousands of tourists from all over the UK and Europe, it might not be long until it is regarded amongst the likes Bearded Theory, Cropready or Beautiful Days. 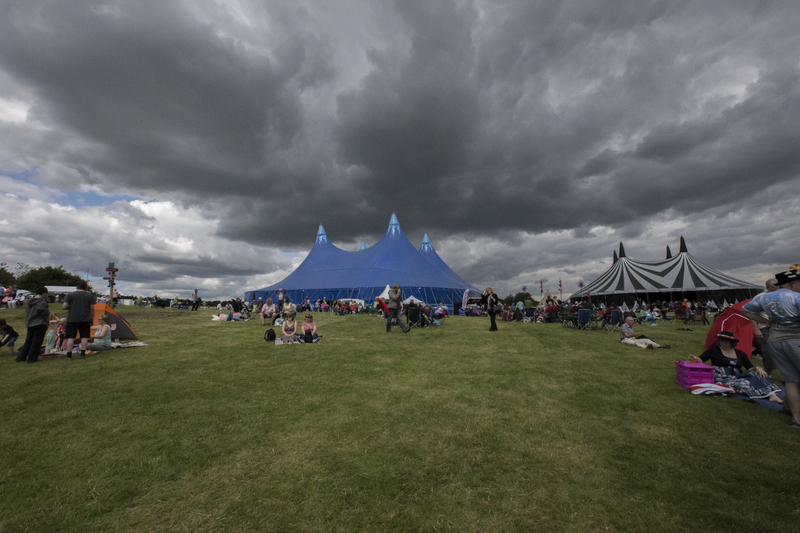 With the festival already occupying most of the farm land, it may soon want to expand and the only way to expand would be a partnership with the local authority and to use the Cannon Hall Park land. That would be a wonderful thing that would do no end of good for the town’s visitor economy but only time will tell. It is still early though, so for now, here’s to UTS 2016. All photographs courtesy of Lewis Ryan Photography. Please do not use without permision.